Modern fridges are available in various sizes with different features incorporated by the manufacturers. Apart from these features the basic principle of refrigeration of course remains the same. The method of deployment hasn’t changed much since from the aforementioned Frigidaire unit in 1923. People think that the refrigerators force cold air into the unit to chill the food inside. But it is not so. What that happens is opposite to what people think. You can notice that there is a labyrinthine series of bends behind the freezer or refrigerator. This coil is known as a refrigerator coil and it runs both inside and outside the refrigerator. It facilitates the exchange of heat from outside to inside and vice versa. 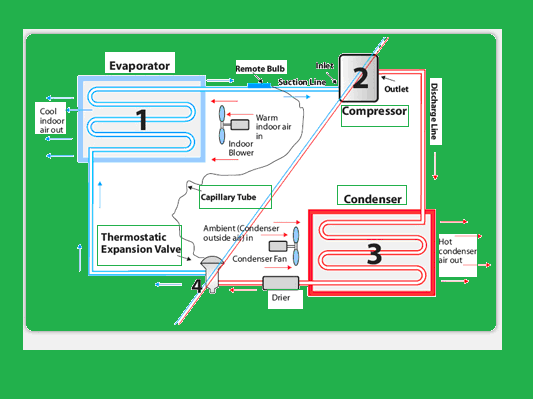 The refrigerator contains an element called compressor which pressurizes the refrigerant gas and pumps it through the bend tubes. As the gas moves, it loses its heat through these metal coils and is converted to pressurized liquid. When a material changes its state from a liquid to a gas, a tremendous amount of heat is absorbed. Hence when the refrigerant changes from gaseous state to liquid it absorbs the heat from inside the fridge. It is again converted from the liquid to gas outside the fridge. During this process the absorbed heat energy is again released outside the fridge. This cycle continues. This is how cooling inside the fridge occurs.